Secretary of Education Betsy DeVos recounted being "so angry" when she was blocked by protesters from entering a school in February and insisted on going in anyway so they would not "win." DeVos, who went through contentious hearings and required a tie-breaking vote from Vice President Mike Pence to be confirmed, was heckled upon her arrival at Washington, D.C.'s Jefferson Middle School Academy on Feb. 10 and physically blocked from entering the building. One man yelled "shame" at her. In an interview with Politico Magazine about her tenure, DeVos' voice reportedly shook with emotion upon recounting the event. "We got back in the car and the security detail said, ‘Ma’am, I don’t think we should go back there,’" Devos said. "I said, ‘No, we are going back. They are not going to win.’"
She paused and then said, "I was so angry." Eventually, she did enter the school, and she called her visit "really wonderful." One anecdote to show DeVos was unlikely to give in was her getting mugged while vacationing in Barcelona some years ago. A thief snatched her handbag, and despite being a billionaire and being able to afford another bag, she held on and suffered a serious knee injury upon being launched into the air. 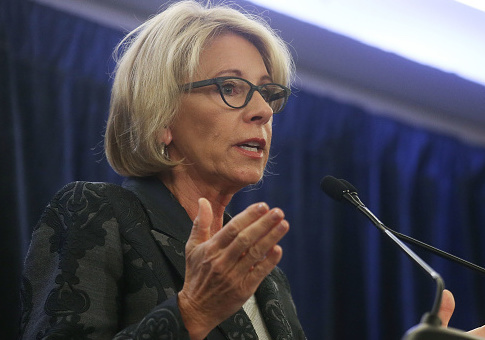 DeVos has inspired angry opposition and protests throughout her tenure from liberal activists due to her views on expanded school choice and curbing of Obama-era sexual assault guidelines on college campuses to encourage due process. In her Politico interview, which focuses on the limitations of her power, she said she had found the "bureaucracy" of the job to be stifling at times. "The bureaucracy is much more formidable and difficult than I had anticipated—and I expected it to be difficult," she said. "It’s even worse. And you know, in talking to a lot of the great career staff, it’s like everybody nods their heads when you talk about this … yet it seems like everyone is powerless to do anything about it." This entry was posted in Issues and tagged Betsy DeVos, School Choice. Bookmark the permalink.